The United Way of Greater Victoria (UWGV) piloted the Community Tables: Engaging Neighbours in the neighbourhoods of Gorge Tillicum, North Park and Oaklands. 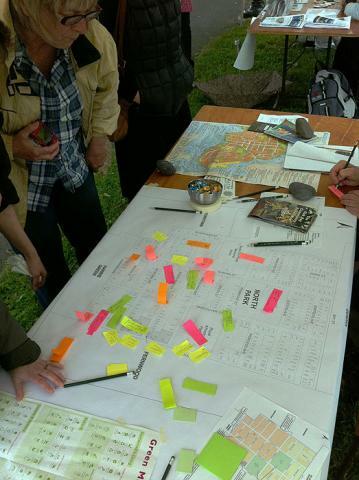 The initiative invited broad-based neighbourhood involvement through engaging local leaders, at resident-based monthly meetings, through the use of community surveys, and the development of an asset and vision community map report for each of the neighbourhoods. The monthly sessions involved group learning and a capacity-building process which helped them explore local challenges, identify assets, and generate neighbourhood focused action connected to United Way’s Impact Areas: All that Kids Can Be; Healthy People, Strong Communities; and From Poverty to Possibility. Thanks to all the amazing participants from the Gorge Tillicum, North Park and Oaklands neighbourhoods who volunteered their time by attending the monthly meetings. January of 2013 will see a new cohort UVic graduate student interns facilitating Community Tables in the Brentwood and Colwood neighbourhoods. View the Community Tables Website for more information.